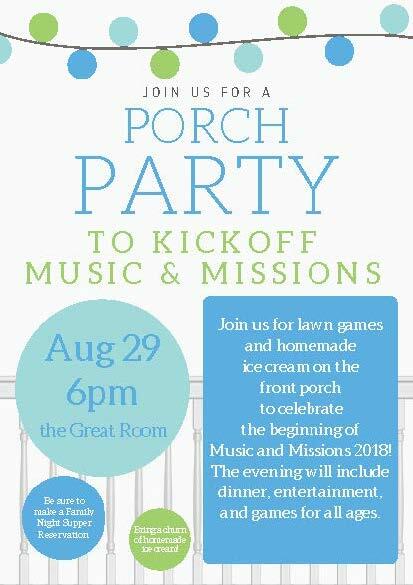 Wednesday, August 29, at 6:00 p.m.
Join us for lawn games and homemade icecream at an old-fashioned porch party as we celebrate Music and Missions. You can relax in our rocking chairs or play corn hole and lawn darts at this fun evening to mark the beginning of our Wednesday night programming for the year. Join our families in the Great Room for a delicious dinner, some entertaining games, and lots of fun. We’ll introduce you to the teachers who will be leading our children and youth in choirs and missions organizations this year and ask for God’s blessings on them as they give of themselves to share God’s love. Make a churn of your favorite homemade ice cream and enjoy this evening of neighborhood fun!